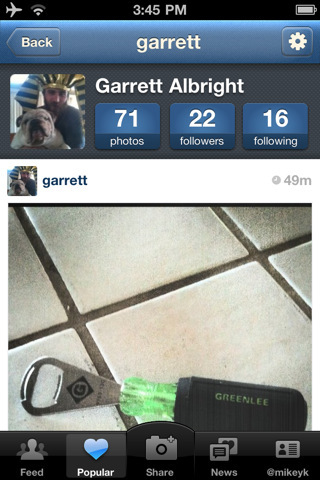 Instagram is an iPhone app that lets you “share your life through photos” that’s picking up ton of steam already. If you’ve never used or seen Instagram before, think of it as a photo based social network that basically lets you keep a social photo based journal, with features that resemble a mix between Twitter, Twitpic, Foursquare, and Facebook. You post photos you either take or have taken on your iPhone to your Instagram profile. The app helps make your pics stand out with a set of classy and classic filters that you can apply to them. Next you describe the picture with “what” and “where” as tags. Finally you can hook Instagram into your other social accounts like Facebook, Twitter, and Foursquare to post to them all at once. The app is divided into 5 tabs; Feed, Popular, Share, News and @you. Feed is where you see the new photos from people you follow. Popular is a thumbnail gallery style list of 32 pics that Instagram has dubbed as such, that you can browse. Share is where you go to take pics, apply filters and tag new posts. News will give you heads up when poeple follow you, or interact with your photos by leaving comments or liking them. @you is your profile editor section giving you access to find and invite new friends, and edit your full profile information. You can find new friends via your iPhone contacts or, Facebook, Twitter, or just search by username. Just added Instagram also has Suggested users section for you to get going as a fresh newbie. On the feed tab you can read user comments on photo posts, leave comments on any photo or hit the heart to like it. As the creator, you have access to Delete, Share, Email or copy the URL to your own uploads. Although this doesn’t stop anyone form taking a screenshot of the screen (lock+home button combo), you can’t download or share other people’s posts, probably for copyright reasons. You do have the ability to flag others’ photos. Tap on any username to view their profile/posts page, including your own. Speaking of which, profile pages have the profile thumbnail along with the full name, and 3 numbers: Photos, Followers, and Following on top, along with a follow button. 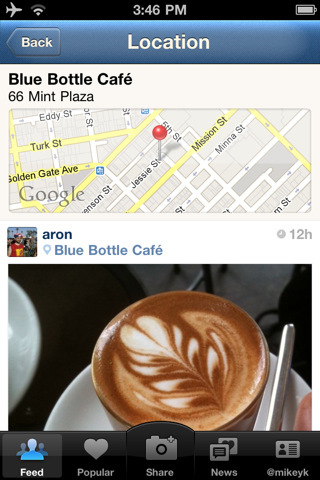 The location based features of Instagram are also pretty impressive. The “where” option when uploading photos lets you choose a business where the photo was taken. Instagram uses iPhone’s GPS to track your location and shows you a list of surrounding businesses to choose from, or you can search for other places by keyword. After uploading, next to your photo you’ll see dropped pin icon and a place link. Tapping that link takes you to a location page with all the photos from all Instagram users that were taken at that location. This is a nice Foursquare-like feature for following your friends around town, and with the Foursquare integration built into Instagram, you can now even use Instagram to post to your Foursquare account simultaneously. You can change your privacy settings in Instagram to set your photo uplaods to either Public or Private. Private basically makes it so that people need verification before they can follow you. This takes place on your entire account and only affect new people not existing followers. It would be great if you could set privacy settings for individual posts as opposed to your entire account. A few other small gripes with Instagram are as follows. The photo filters in this app are amazingly cool and I wish the app gave users the option to just apply filters to photos without having to post them on our profile. Although you can go through and apply filters to your posts, and cancel half way through, to get this effect, it is not by design. Another missing feature is to search for photos/posts by keyword. I’m sure this is coming sometime in the future. 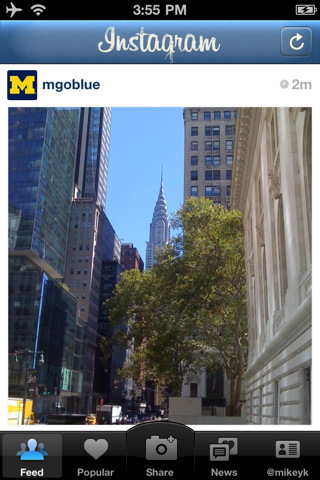 Finally, similar to Path, Instagram is limited to the iPhone, so you can only see it and use it on your iPhone. You can log in from the web but only to edit your Instagram profile, no viewing options are provided via the web. Instagram photos are cropped into a square, and filters give them a semi Poloaroid like quality. In addition to the normal filter, eleven other amazing filters are included in Instagram, and more seem to be getting added with updates. Update: The latest version of Instagram adds Radial tiltshift mode as an option. There have also been improvements made in the quality of the image and speed improvements. 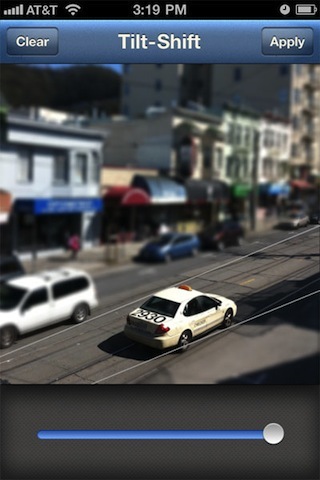 To get the best results in Tiltshift mode just take a picture then tap the “tilt shift” button the the screen. Two lines are placed over the picture. Pinch to zoom in out on the area and drag the slider to adjust the blur level of the area outside of the tilt-shift box. Hit apply to save your changes. Photos taken from a high vantage point from afar work best with tilt-shift. Image courtesy of MacLife. 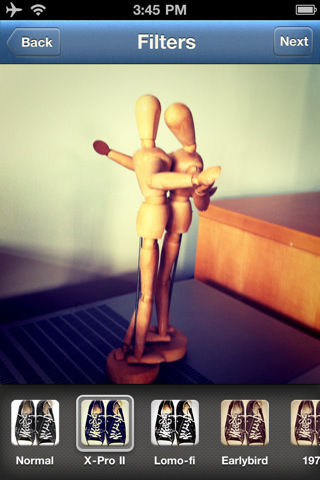 Overal, Instagram is a wonderful new social tool that takes things to the next level. The app has a beautiful icon, excellent graphics and a simple to use interface. For these reasons Instagram has been growing like wildfire in no time and only goes to prove the old saying … “a picture is worth a thousand words”. Get the free app and start sharing your pics. AppSafari review of Instagram was written by Joe Seifi on December 20th, 2010 and categorized under App Store, Featured, Fun, GPS, Local, Photos, Social. Page viewed 9568 times, 2 so far today. Need help on using these apps? Please read the Help Page. Your blog is very good! Congratulations!